I want someone who will talk to me honestly about things. You're the only person who ever has. Maybe you don't know this, but when you're disabled almost no one tells you the truth. They feel too awkward because the truth seems too sad, I guess. You were very brave to walk up to the crippled girl and say, essentially, wipe that sunny expression off your face and look at reality. That's what I want you to do next year. Tell me the truth. That's all. First, the cover for this novel is gorgeous. I love the soft colors and cartoonist effect it has. The book's description about two people helping each other through an unexpected friendship, and perhaps something more, is what drew me in second. I have not read anything by this author before, but I am definitely attracted to this story. 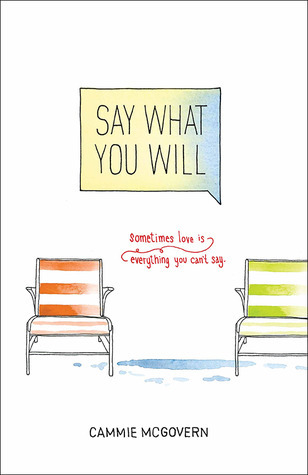 The cover reminds me of Rainbow Rowell covers and I'm hoping that it's a good sign. I haven't heard of Cammie McGovern either. I love how different this cover is. I'm really digging the use of watercolors and simple shapes in this. While I haven't heard of Cammie McGovern, I'm looking forward to this book since the premise of unexpected friendship as well as honesty, seems interesting.